At the invitation of Premier Li Keqiang of the State Council, Prime Minister Hun Sen of the Kingdom of Cambodia will pay an official visit to China from January 20 to 23. President Xi Jinping, Premier Li Keqiang, Chairman of the NPC Standing Committee Li Zhanshu and Chairman of the National Committee of the CPPCC Wang Yang will meet and hold talks with Prime Minister Hun Sen respectively. Prime Minister Hun Sen will also attend the China-Cambodia economic forum and meet with friendly personage. We hope and believe that through this visit, China and Cambodia will consolidate traditional friendship and further promote the comprehensive strategic cooperation between the two sides. As agreed by China and Germany, the 2nd China-Germany High Level Financial Dialogue will be held in Beijing on January 18. Vice Premier Liu He of the State Council and German Vice Chancellor and Federal Minister of Finance Olaf Scholz will co-host the Dialogue. Q: Could you give us more information on the 2nd China-Germany High Level Financial Dialogue? What is China's expectation for this round of Dialogue? A: China and Germany decided to establish the China-Germany High Level Financial Dialogue on March 2014, to strengthen financial communication and coordination, deepen practical cooperation in the relevant field, and sustain the sound development of China-Germany comprehensive strategic partnership, through regular high-level bilateral dialogues on major financial issues of strategic, comprehensive and long-term importance. The two sides agreed that during the 2nd China-Germany High Level Financial Dialogue, discussions will be held on the macro-economic situation and global economic governance, China-Germany strategic cooperation, and financial cooperation and regulation. This will be the first high-level dialogue in the financial field between the two sides since China and Germany formed new governments. China hopes that through this round of Dialogue, the two sides will further strengthen communication and coordination on major bilateral and international economic and financial issues, enhance mutual understanding and mutual trust, and expand consensus on seeking common interests. On the basis of seeking mutual benefit and win-win results, China and Germany will adopt positive measures to promote practical cooperation in the financial field as well as the sound and steady development of China-Germany economic ties to deliver more tangible benefits to the two peoples and business communities. Q: Last week, Poland arrested a Chinese employee of Huawei in Poland for allegedly spying and I noted that the Chinese Embassy in Poland said that it was opposed to deliberate smearing and unwarranted fabrications. I want to ask if that means China views this allegation as false? 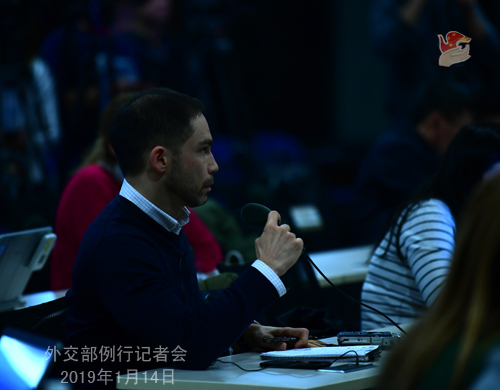 A: Regarding this case you mentioned, we noted that both the relevant Polish side and Huawei have said in their statements that the case of Wang Weijing is entirely an individual one. The Polish side should arrange for a consular visit by the Chinese side immediately, handle this case in accordance with the law and regulations on the basis of facts, and earnestly safeguard the legitimate and legal interests and humanitarian treatment of the person involved. Q: Did the Chinese Embassy in Poland talk to the Chinese citizen who has been arrested on suspicion of spying for China? If yes, can you provide some details on his situation right now? A: I have no more details to offer at this moment. I believe you might have noted that the Chinese Embassy in Poland has uttered its voice at the earliest time possible. Officials from the Chinese Embassy in Poland have also met with officials from Poland's Foreign Ministry, asking the Polish side to make consular notification on the situation to the Chinese side and arrange for consular visit as soon as possible and fairly and properly handle this case in accordance with the law. Q: It is reported that the US has agreed to allow some military enterprises to export their technology to support Taiwan's Indigenous Defense Submarine (IDS) program. Many US, European, Japanese and Indian companies have expressed their willingness to participate in the program. What is your comment? A: China firmly opposes arms sales to Taiwan by any country and military links in any form between any country and Taiwan. This position is consistent and clear. 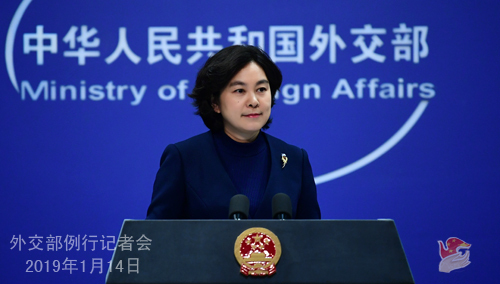 We urge the US and other relevant countries to keep in mind the sensitivity and graveness of this issue, earnestly abide by the one-China principle, not to permit relevant enterprises from participating in Taiwan's Indigenous Defense Submarine (IDS) program in any form, stop having any military links with Taiwan, and prudently and properly handle Taiwan-related issues so as to avoid severely undermining their bilateral relations with China and peace and stability across the Straits. Q: Some people have compared the situation with Poland to the one with Canada and suggested that Polish citizens in China might now be at risk of sort of "retaliatory"detention. So I would like to ask you do Polish citizens in China need to worry about China taking any "retaliatory"measures against them since the Chinese citizen was arrested in Poland? A: On China's part, we value our relationship with Poland and believe that maintaining the sound and steady development of China-Poland relations serve the common interests of the two countries. We hope that Poland will move towards the same direction and make joint efforts with China, do more to enhance our mutual trust and cooperation so as to ensure the continuous sound and steady development of China-Poland relations. The relevant Chinese departments handle the individual cases of foreigners in China in accordance with laws and regulations. I don't think it's necessary for certain individuals to issue groundless warnings out of fear. I believe foreign citizens are always welcome in China as long as they abide by Chinese laws and regulations and their safety and freedom are guaranteed. Q: You said just now that the Chinese side asked the Polish side to make consular notification to it as soon as possible. Does that signal that by far China has never got such consular notification? A: Like I said, the Chinese Embassy in Poland has lodged representations with the Polish Foreign Ministry at the earliest time possible, asking them to conduct consular notification as soon as possible and make clarification and explanation on the reason for and situation of the detention of Wang Weijing. Follow-up: Has the Chinese side received any consular notification from the Polish government or not by far? A: I believe you speak Chinese very well and you indeed understand what I said. Q: According to reports, Canadian Prime Minister Justin Trudeau said on January 11 that China has arbitrarily and unfairly detained two Canadian citizens, and is not respecting diplomatic immunity in the arrest of former diplomat Michael Kovrig. This is something that they are engaged right now both with Chinese officials and with their partners around the world, and there is a need for all countries to do like Canada and to respect the rule of law and the independence of our judicial processes. What's your comment? A: I have seen relevant reports. The relevant Chinese departments have handled the case in accordance with the law and the accusation of "arbitrarily" detaining Canadian citizens is totally unfounded. As for the issue of immunity, I would suggest relevant person in Canada to read and study the Vienna Convention on Diplomatic Relations and international law first before making any comment, instead of making himself a laughingstock with specious statements. Michael Kovrig is not entitled to diplomatic immunity under the Vienna Convention on Diplomatic Relations by any measure. He is not currently a diplomat. Michael Kovrig used an ordinary passport and a business visa to come to China, who has been taken compulsory measures by relevant Chinese state security organ on suspicion of involvement in activities endangering China's national security. He doesn't enjoy immunity in accordance with the Vienna Convention on Diplomatic Relations and international law. As to the Canadian side's claim that all countries should respect judicial independence, I believe this is quite right if only the Canadian side itself could first prove its judicial independence with concrete actions. A: Indeed, some people have been trying to crack down on and restrict the overseas development of China's hi-tech enterprises by making non-existent charges on the grounds of the so-called "security threats that might exist". I believe that everyone can see through their true motive behind this. I also believe that you all agree that security issues need to be backed up by facts and you need solid evidence to determine which actions, who and which companies pose real security threats. Huawei's reputation in security has been enjoying its partner's praise and approval for all these years. We urge the relevant party to stop its rumor-mongering and unreasonable suppressing of Chinese enterprises including Huawei. A fair and sound environment needs to be created for bilateral investment and normal cooperation between the business communities of the two sides. To play up the issue and obstruct or suppress business by abusing the issue of security will only end up hurting its own interests. 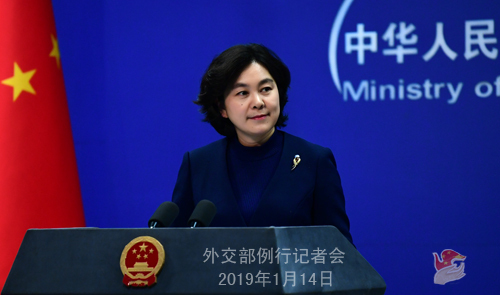 On January 8, my colleague Lu Kang announced here the first birthday of the official WeChat account of the Spokesperson's Office of the Ministry of Foreign Affairs. Thousands of enthusiastic and warm messages haven been left under the article in celebration of the first anniversary of the account, and we're deeply moved and inspired by all these wishes, encouragements and advice. Here I would like to express our heartfelt thanks to all of our followers on behalf of the Spokesperson's Office of the Ministry of Foreign Affairs! We have selected 100 followers and will send special gifts to them as soon as possible. Since the namelist is a little bit too long and I'm afraid I can't finish reading it without laughing as Senior Colonel Wu Qian has done, I'm not going to read out the ID of all these followers one by one. Please check out whether you're one of those lucky guys on our official Wechat account where the namelist will be issued today. On the first birthday of the official account, its followers get a unique nickname "Faxiao" , which means the little friends of the Spokesperson's Office of the Ministry of Foreign Affairs who have accompanied us to grow up all along. In the future, we are going to celebrate more birthdays and have more activities of interactions together. We hope that all of the "Faxiao" will stay with us all the way with support to each other, and cheer on for China's diplomacy in the new era together. Thank you!